Michael Bolton is an American singer-songwriter born in 1953. Initially, he had a long career under his real name Michael Bolotin and then found success as the lead singer in the group Blackjack. The band released two albums during the 1970s but by 1983 he had launched a solo career as Michael Bolton. His debut album was Michael Bolton (1983), which was moderately successful. Unfortunately he did not maintain the momentum and his second album Everybody's Crazy was a flop. The Hunger was released in 1987 and became his breakthrough album. With it he abandoned his rock pretensions and concentrated on the power ballads for which he would become famous. Soul Provider was released in 1989 and became a huge hit, selling four million, winning a Grammy and spawning three hit singles. Michael Bolton is the third studio album by American recording artist Michael Bolton. The self-titled album was Bolton's first record to be released, in 1983, on Columbia Records. 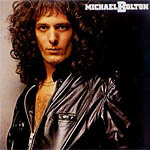 This was also the first time that Michael Bolton recorded under his stage name; his previous releases, Michael Bolotin and Everyday of My Life, had been released under his given name, Michael Bolotin. It features then future Kiss guitarist Bruce Kulick on guitar on lead leader, rotating with Bolton himself. Future Trans-Siberian Orchestra, Savatage and Megadeth guitarist, Al Pitrelli replaced Kulick on the tour supporting the single, "Fool's Game", though the tour was cancelled after four shows.